When the grade-separation overpass on State Route 347 becomes a reality, it will alter several properties. Most are businesses. Some will be bought and demolished. Others will have their access dramatically changed. All have to wait for the Arizona Department of Transportation. “It’s teaching us patience,” said Pastor Jim Johnson of the First Baptist Church, which might be in the way. The expected southbound path of the overpass removes the current dogleg curve to the west at Maricopa-Casa Grande Highway and follows a straighter route. That would run the overpass over Maricopa Fire Department’s administration buildings, near F.O.R. Maricopa food bank, the former La Roca bar property, a salvage yard, part of Copa Center, NAPA Auto Parts, Spoon’s Café, the Amtrak station and First Baptist Church. Several of those lots belong to the city. Maricopa bought and demolished La Roca last year. The MFD buildings and Park-n-Ride lot belong to the city as does the Copa Center. Of the other property owners, some are certain their property will be acquired by the city while others don’t know because of the uncertainties of ADOT’s plans. There are anxieties for both as they wait for ADOT to move forward on its design. “Until they finish the design to 30 percent, they won’t be able to tell us for sure,” Johnson said. ADOT is using what it is calling Alternate H. That plan runs straight over First Baptist Church, which is more than 60 years old. While there has been talk at the city and state level of somehow accommodating the church into the plans, all Johnson knows for certain is ADOT prefers Alternate H.
The church had already been raising funds to build two other buildings on its 1.06 acres. If necessary, those funds could go toward purchasing a new property when combined with money from the city’s right-of-way acquisition. Its full cash value has most recently been assessed at $150,000. Its market value will be the point of negotiation. Johnson is just as worried ADOT’s final plan will not force the demolition of the church but will bring the overpass traffic dangerously near the church and make access difficult. Businesses on both sides of State Route 347 south of the tracks will have their access impacted. “There will be a dead end on 347. There’ll be a dead end on Maricopa-Casa Grande Highway. They’ll put about 10 businesses out of business,” said Don Pearce, who does not think the overpass is necessary. 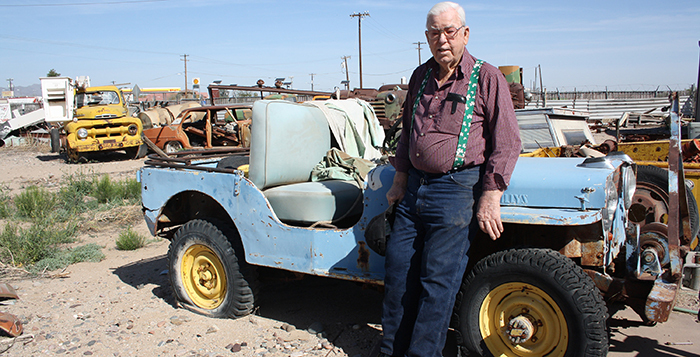 Pearce owns property full of salvaged vehicles next to Copa Center. It was four lots when he bought it and now is two parcels of a quarter-acre each. He said there was once a home on the property, which is marked as residential, but that is just a concrete slab now. He put up the newer building he uses as garage, workshop and storage unit. Whatever he uses the property for at the moment, it is definitely in the path of the overpass. “They’re supposed to negotiate a price on it,” Pearce said. He said some buyers had been interested in the property until the overpass discussion started. Now he’s worried he will not get the value of the property as real estate prices begin to rise. One of the lots has a full cash value of $46,367 and the other $48,764. Pearce expects a bid soon on most of the contents of the lot. The vehicles that are not for sale he will move to another parcel. Acquiring right-of-way is the responsibility of the City of Maricopa. In March, the city council signed an intergovernmental agreement with ADOT to that effect. ADOT is in the middle of a public-comment period on its updated five-year program. The Maricopa overpass is among ADOT’s suggestions to move forward on a quicker timeline. The State Transportation Board will finalize the projects and timelines for the five-year plan in June. The project is set to receive $19 million from the state, $15 million from a federal TIGER grant and $15 million in local contributions. Meanwhile, First Baptist Church has been consulting with attorneys who specialize in property value negotiations. Johnson said he has also spoken with leaders at Ahwatukee’s Mountain Park Community Church, which is going through a similar situation with the Loop 202 extension. Like Pearce, he is concerned about rising real estate prices as First Baptist considers buying another property. He said not knowing yet what ADOT’s plans will mean for the church parcel has left them in a holding pattern as the church membership tries to figure out its future. This story appeared in the April edition of InMaricopa.